I started Aikido back in August 2001 when I was 24 at the Irchester Dojo which seems a long time ago now! Probably seems longer for Steve and Aub! I had been interested in Martial Arts for a long time but I never seemed to have the time to start one as Football and work seemed to take all my time up. This all changed in August 2001 when the dad of a very good friend of mine died suddenly, which made me put my own life into focus and I decided to stop putting things off that I wanted to do. My decision to choose Aikido other styles was mainly due to my friends bad experiences with other styles such as Karate and Tae-Kwon-Do and also being a closet Steven Seagal fan and when I found out that he was an eighth degree black belt in Aikido it seemed to be the Martial Art for me! The way I found out about our club was by just pure chance as one day in my local gym I was talking to one of the trainers about Martial Arts he said that he had just started a style called Aikido at a local club in Irchester and that was it I started the following week the day after my friends fathers funeral. I meet Steve Copson on my first night and to be honest I am not sure what he thought when this big Sasquatch walked through his door! As soon as Steve started the class it blew my mind and I was totally hooked on the art. One of my big concerns when I started Aikido was that the club would be very strict and regimented and was very glad to find the club very respectful of the art but also taught in a relaxed manner. After my first grading I decided to practice twice a week and started to attend the Northampton club on a Tuesday night and this is were a meet our head instructor Aubrey Smith who just left me amazed on his control of the art. I also meet a Scottish brown belt called Joe who I couldn’t understand for the first six months but since then I have learnt jockernesse and can now communicate with him with sign language. When I started practicing twice a week my ability and confidence grew and feel I was very lucky to have a period on Tuesday nights were it was just Steve, Joe and myself at the club for 3 months and this is the time where I really felt I progressed with the art. I took my 1st Dan Black belt in February 2006 which was an unbelievable experience for me and was amazed the a lot of people who I had meet over the previous 4½ years from other clubs and associations had made the journey to be there on my grading. The day itself was a blur and the evening in the pub after is an evening bigger blur! 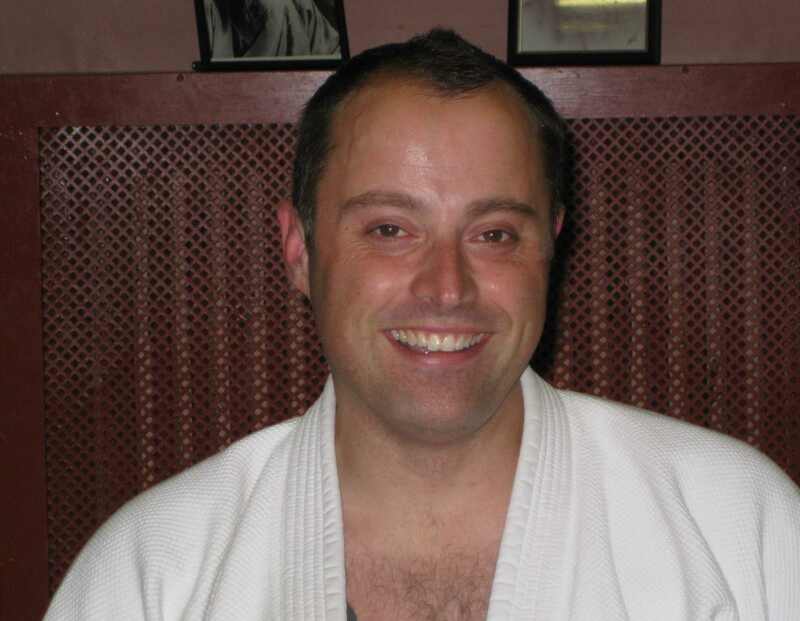 After I received my Dan grade I started to help Steve more in the sessions with the beginners and this time was very influential on the development of my Aikido and was a period where I felt I improved the most in my Aikido career. Both Joe and I took our first Dan’s around the same time so we decided to go and get our Instructors course qualifications from the BAB which we both received in November 2006. I took my second Dan in September 2008 which for me was my strongest grading yet but more for the class I taught than the actual technique grading as I felt I displayed my understanding of the Art and started to show what I can do. I would describe my style as a strong mix of Aubrey’s and Steve’s and a little bit of my own thrown in for good measure. After 13 years I feel I have only scratched the surface of what this art has to offer and I look forward to the next 40 years to try and learn as much as I can. I truly feel I have been very luck to be taught by both Aubrey and Steve and urge anyone reading this to practice with them as much as possible. The club is a very relaxed environment and is by far the best Aikido I have seen and I have learnt a lot being involved with but more than that I have made some lifelong friends (even Joe!) from it which I am truly grateful for.